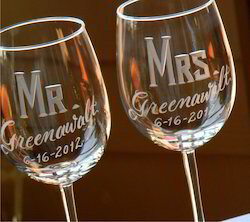 Buy Engraved Gifts such as Plaques, Shot Glasses, Whsikey Glasses, Wine Glasses, Champagne Flutes, Cognac Glasses, Vases, Decanters etc. The clock measures 57mm in diameter and the compass 52mm. When closed, the lid of the box has a metal engraving plaque that can be customized to create a stunning corporate gift or presentation item. These clock-compass travel sets are offered here with free engraving of both text and logos. - Size: Clock: 57mm dia / Compass: 52mm dia. Handmades is one of the leading & the pioneer of Glass Quotation Gift in India. Our Corporate gifting products offer a unique opportunity to get your Company’s name out to its target market and maintain it there. We supply a wide range of promotional executive items such as Diaries, conference folder, wallets, mugs, coaster etc. to a wide variety of engraved corporate gifts and so on. We also offer various options for branded gift packaging as per client requirements. Made for gifting your near ones, your employees as a gift to the married couple with their names engraved. Corporate gifting with the company name or logo engraved on it. Are you interested to make a special gift for this Valentine’s Day Check out the lovely collections of wooden engraved gifts offered by Surprise Gifts. 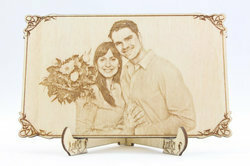 This wonderful photo frame can be an ideal gift to send on special occasions. Create a customized gift and make the special moment as more special with Veenaa Metal Art's unique gift colections.